The City Gallery of Bratislava consists of 2 historic buildings- Mirbachov palac and the Palffyho palac. Initiated by the donation from sculptor Viktor Tilgner in 1883, City Gallery’s first foundation were laid by his exclusive art works which gave way to the establishment of the current museum in 1961. Today, the museum showcase Bratislava’s rich cultural, heritage and art works which are second to none- having around 33,000 art pieces including old paintings, sculptures, fine art from the 20th and 21st century and also some rare pieces which date back to the 18th century. The buildings themselves are a historic icon and if you love architecture and design more, a walk through the buildings will feel surreal. Refer official website for special events' ticket prices. How popular is Bratislava City Gallery? People normally club together Galeria Nedbalka and Kapitulska Street while planning their visit to Bratislava City Gallery. Interesting and free. It is situated near the river, in the old part of the city. Quite a few things to see around and lots of cafes and restaurants nearby. Great experience, will be returning again. 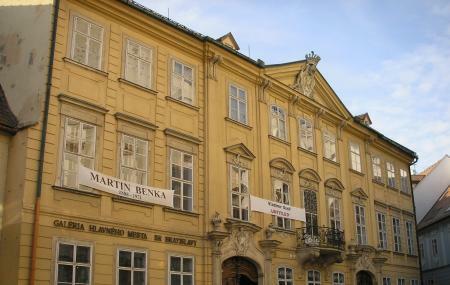 The museum has 5 floors of art, where the lower are focused on traditional art and the top modern and installation art. Be aware that you'll have to pay €1 to take photos of the art. I really enjoyed the modern art which I thought was fantastic, especially the hallway of books. Just brilliant.